- The Only Way is up for Yazz Number One Hair Studio! The Only Way is up for Yazz Number One Hair Studio and its Trainees! A FORMER Scottish footballer recently returned to the Leeds-based hairdressing salon he opened some 19 years ago to recreate a now-sentimental photo for owner, Paul Shakeshaft. John Hendrie first cut the ribbon on Yazz’s first salon – located in Yeadon, Leeds – joined by hairdresser and owner Paul and his then three-year-old daughter, Yasmin. The inspiration behind the salon’s name, Yasmin – then just a toddler – happily posed for a picture with her Dad and the footballing star – but little did she know back then that she’d eventually join the hairdressing profession too. Now, almost two decades later, John agreed to pose for a light-hearted recreation of the same photo that marked the beginning of an exciting career for Paul – and now, for his daughter Yasmin. 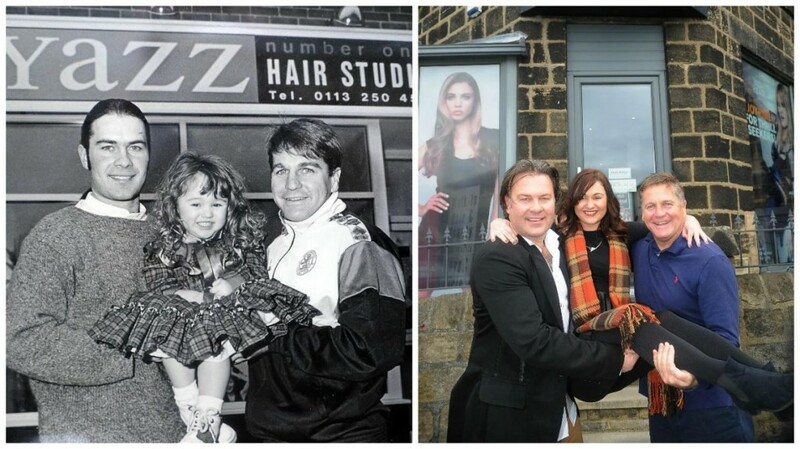 Then and now: Paul Shakeshaft (left) opens the first Yazz Number One salon nearly 20 years ago, with former footballer, John Hendrie cutting the ribbon. Twenty-two-year-old Yasmin says if it wasn’t for the success of her Dad’s business she wouldn’t have joined the profession in the first instance. While Paul encouraged his daughter to join the hair industry when she left school, a then 16-year-old Yasmin had other ideas. Insistent she wanted to take on an office job, Yasmin later realised hairdressing might be the right career path after all. Now with three salons – including one in Guiseley and Rawdon – Yazz Number One Hair Studio also incorporates a training academy for budding hair dressers who’d like to gain their very first insight into the exciting industry. Paul is thrilled his daughter Yasmin is now in high demand with clients visiting Yazz for a new salon, saying that thanks to the company’s training academy, he’s always on the lookout for budding hairdressing talent.